Throughout this short cherry season, I’ve failed twice at making a simple cherry dessert. My potluck chocolate cherry clafouti landed upside-down on the bedroom rug (don’t ask). And the flavor wasn’t chocolatey enough to try again. 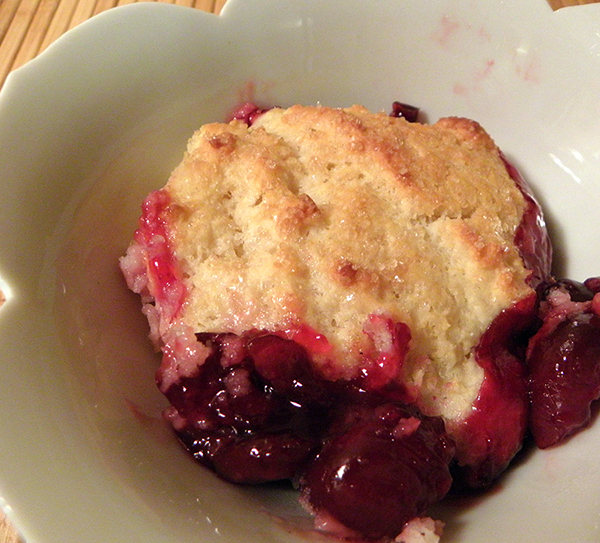 Next, Fresh Cherry Cobbler, a top recipe from the usually brilliant All Recipes website, tasted more like butter and sugar than cherries. So, back to my favorite cobbler resource, Crumbles and Cobblers, to adapt a Berry Cobbler recipe. 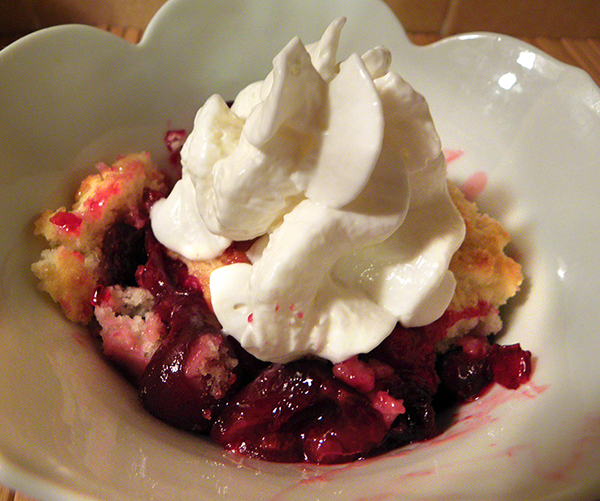 Light pastry tops a just-sweet-enough base of cherries, and leftovers were solid enough to go car camping. Though usually teamed with baking soda, the buttermilk in this recipe is paired with baking powder. This buttermilk duo, along with minimal mixing of wet and dry ingredients, is the secret to the light pastry with just a bit of crunch on top. I reduced the sugar in the fruit so that there’s less than ½ cup in the entire recipe, which allows the rich cherry flavor to shine through. 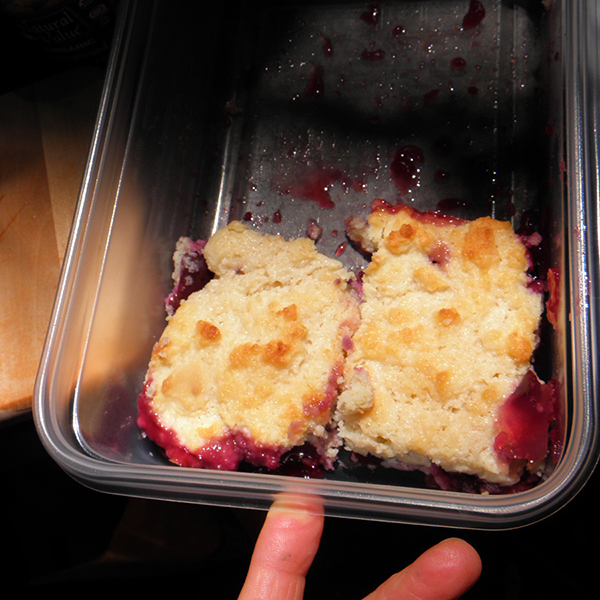 This cobbler will taste best on the first day, before the fruit layer becomes dryer and the pastry layer wetter (and no longer crispy). However, if you serve leftovers as a breakfast “dessert,” or around the campfire after dinner, you are unlikely to hear a complaint. Just a couple more weeks of cherry season, so let’s enjoy while we can. Or, substitute blueberries, raspberries, blackberries, or fresh currants, either separately or in combination. Pit the cherries; a cherry pitter makes this easier and faster. Then examine the cherries carefully to be sure that all pits are have been removed (cherry pits are notoriously clingy, and can break an unsuspecting gourmand’s tooth). Sprinkle cherries with lemon juice, then mix in ¼ cup superfine sugar and cornstarch. 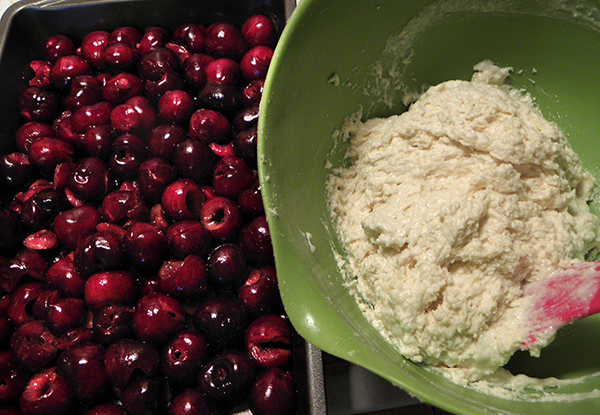 Turn cherries into the bottom of a 7” x 11” or 10” square baking dish and push down gently into an even layer. Set aside. To make cobbler topping, be sure that butter is diced into 1/8-inch pieces and chilled (I put it in the freezer for a few minutes). Sift flour and baking powder into medium mixing bowl. Whisk in salt. Rub in chilled butter with fingertips until mixture resembles fine breadcrumbs. Stir in 2 tbsp. superfine sugar. Pour in buttermilk and stir from the bottom with a rubber scraper just until mixture becomes a soft, light dough. 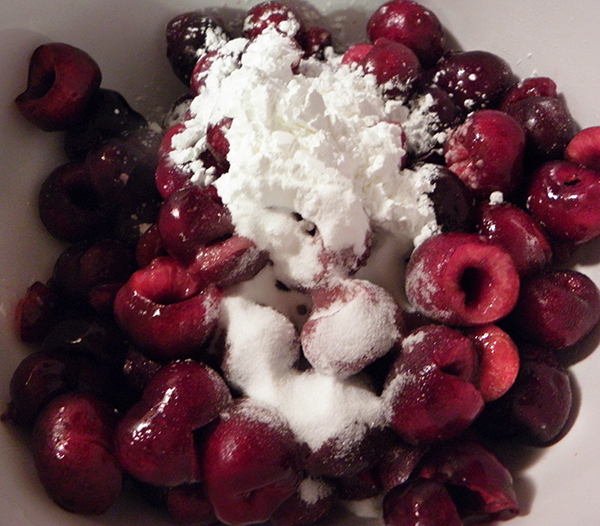 Drop spoonfuls of dough on top of cherries. Smooth out gently but do NOT cover fruit completely. Sprinkle with raw sugar. Bake at 400 degrees F for 25 – 30 minutes, or until crust is golden and fruit is tender. Remove from oven and let stand 10 – 15 minutes before serving, with or without cream or whipped cream. To store leftovers, completely cool then cover with a tea towel, or partially with plastic wrap so that air can circulate. Eat leftovers within a day or so.